If you'd like to study this overview in more detail, here's the high-resolution pdf. Hey, did you know that place that was so many people referred to as the Corning Preserve for so many years is now officially called "Corning Riverfront Park"? Well, it is. The new name is intended to reflect that the space is more like a city park than a nature preserve. + Widening the multi-use path to accommodate two-way biking and walking, and also extending the path south toward the USS Slater, and north toward Erie Boulevard. 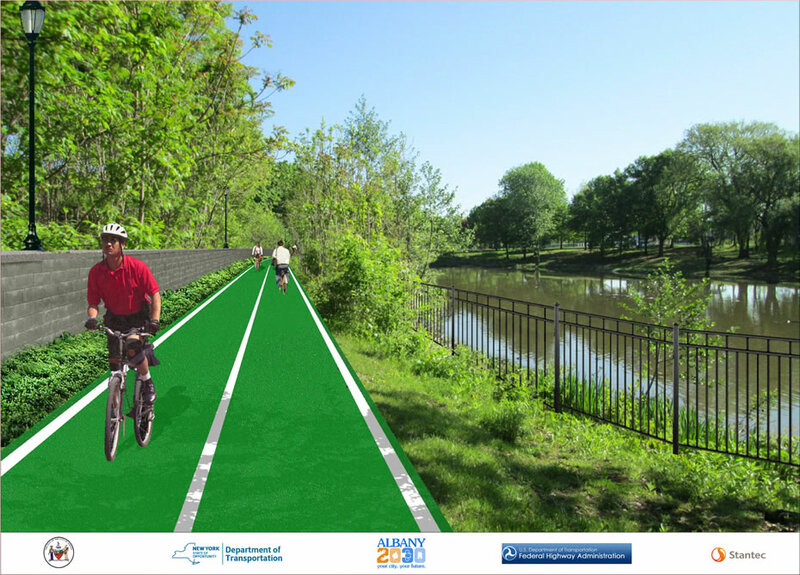 + Construction of a new path along the western side of the tidal ponds so walkers and cyclists can bypass events in the park. + That road that looks like an on-ramp alongside the park? It's actually a city street -- Quay Street. And the project will be narrowing it to one lane. That will free up space for the multi-use path, allow for almost 50 parallel parking spaces, and the hope is, calm traffic along the stretch. + Add crosswalk signals at three intersections, along with new wayfinding signage, to make getting over to the park easier to understand. 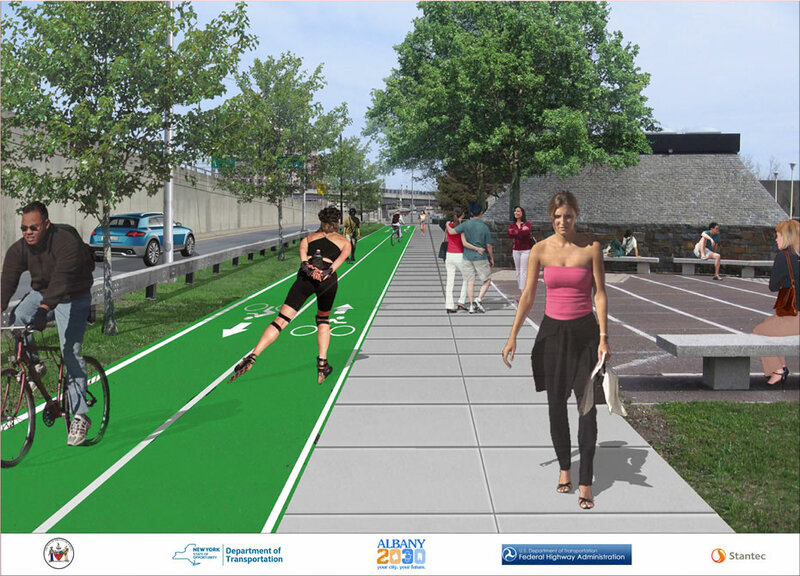 The project is funded with $4 million from the state of New York and $1 million in bonding from the city of Albany. It's scheduled to be completed by the end of this year. There are project renderings above in large format -- click or scroll all the way up. We recently walked through the park with Kate Lawrence, a senior planner and sustainability coordinator for the city of Albany. And when we asked her to describe the current state of connectivity between the park and the rest of the city, she had a one-word answer: "Confusing." Lawrence said that, aside from the pedestrian bridge that runs from Broadway across 787, most people probably don't have a good sense of how to get to the riverfront. "The idea behind this [project] is to make it more obvious that you can get to the park via other means, other entrances and to direct people so they don't get lost." This is the underpass that leads to Erie Boulevard (and in the direction of the Warehouse District and Arbor Hill). 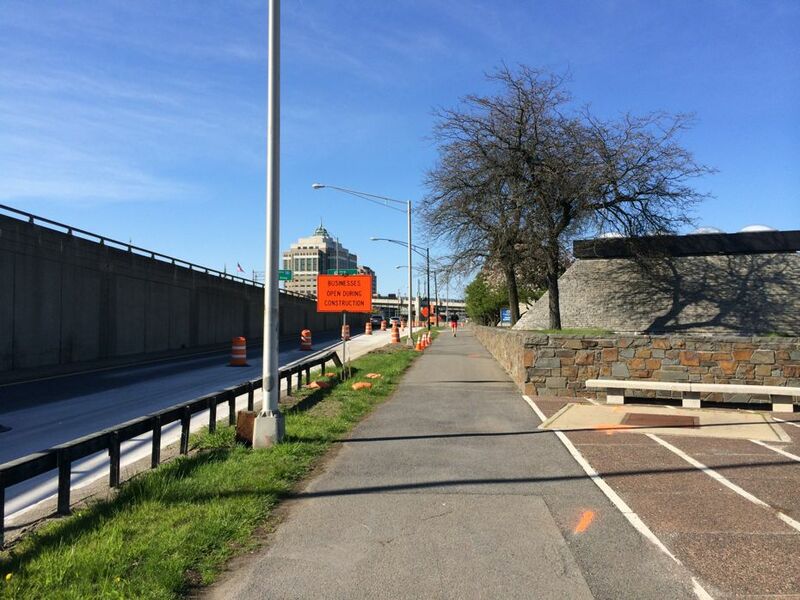 It's set to get new signage and an extension of the multi-use path through the underpass and and up to Erie. 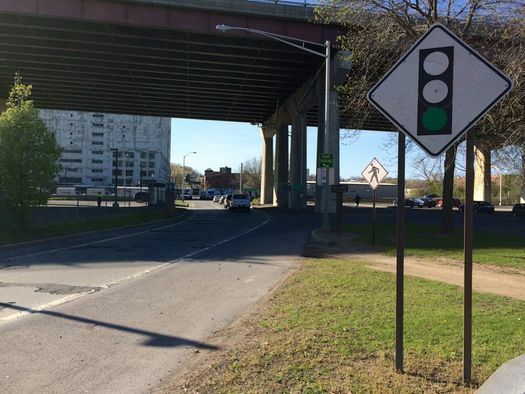 She said new signs will provide direction, and the new crosswalks and multi-use path extensions will make it clearer how to use the 787 underpasses that connect the riverfront to downtown. And if that doesn't sound like a whole lot now, Lawrence said she thinks it will make an impact once it's place. 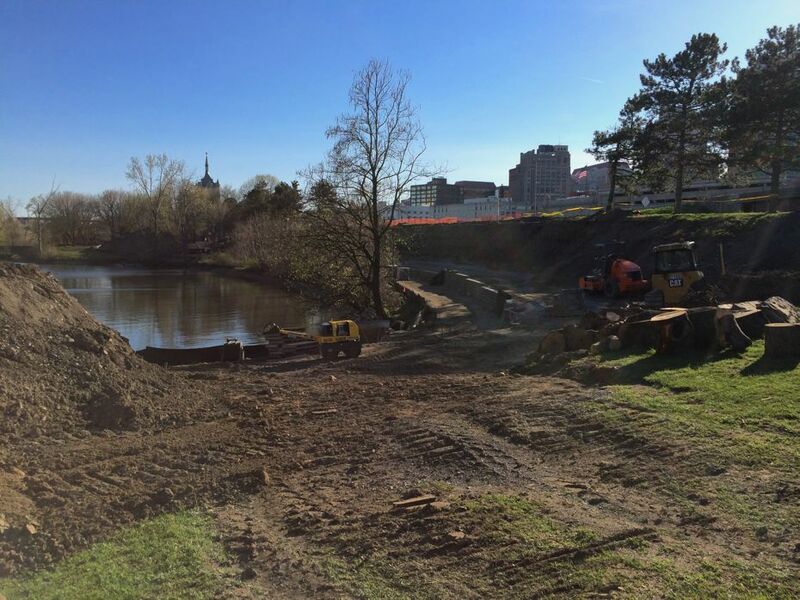 "What will be surprising to people is how easy it will be to navigate from the entrance to the riverfront park by the boat launch [on the north end] all the way down to the USS Slater [on the south end], and to see how those places are connected. And also to see with the wayfinding signage to see what the distances are in miles to other places and how you might get there. It's very confusing down here because of 787 and all the roads to understand how things connect." Lawrence said this riverfront project fits into a larger overall goal that the city has right now to find ways to better interconnect the city's various neighborhoods, parks, and resources. The two-way multi-use path is set be extended to the south near USS Slater. 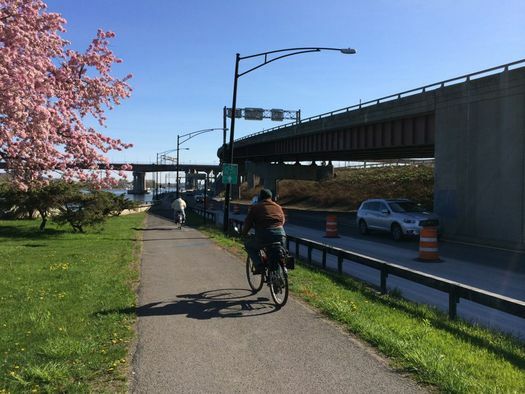 Another example: An upcoming project focused on connecting the Albany County Helderberg Hudson Rail Trail to Mohawk-Hudson Hike-Bike Trail in the South End. There will be public events later this spring/summer to gather input about preferences for what that might look like, and what path it could take. The current project isn't necessarily the end of improvements for the riverfront park -- it's just what the city has the funding for right. The city developed a master plan for the space a few years back, and Lawrence said they're working on gathering the funding to pursue more elements. She said the city has a state grant that's funding a look at the park's tidal ponds and how they might be opened for recreation -- like kayaking -- while also preserving them as wetland habitat. The city is also talking with the state about getting permission to allow private vendors so there could bike or kayak rentals. These are incremental improvements. And Lawrence acknowledged that sort of pace can be frustrating to people. But it's matter of working with the funding and resources available. She added: "The one thing I would to say to everybody who would love to see changes, when you see a planning opportunity or public meeting, you should come!" 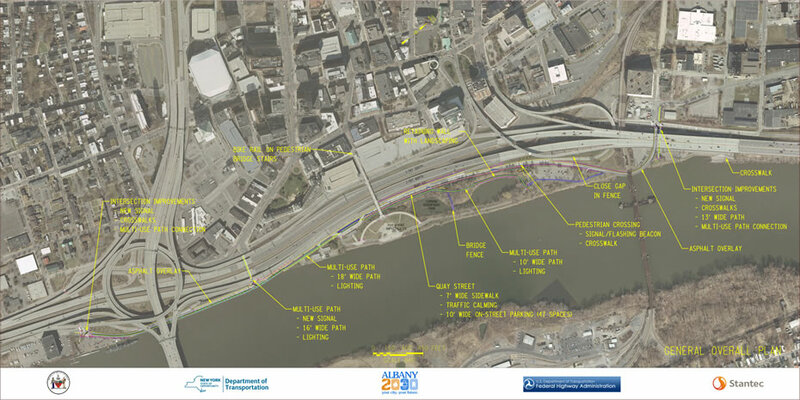 Because those meetings -- like the upcoming events for the rail trail connector and the city's ongoing Rezone Albany process -- are an opportunity to get your ideas and comments about projects on the record and help steer their future directions. Very interesting. I had been wondering what was going on there on the other side of the pond, since I walk the path every day. I like the green path markings. I frequently bike to work on the path and have to dodge people standing around on the asphalt. When I'm on a bike, to me that's a road, so keep it moving! Maybe the paint will make people more alert. How many people honestly have gone to the Corning Preserve and said "wow, if only there were a few thousand other people here, this place would be amazing"? I'm going to miss the preserve. Also, how about instead of trying to draw people to the riverfront with new parking spaces and kayak rentals, we improve the city's existing parks that are withing walking distance of many residents. You know there's a lake at Washington Park, right? How about kayaks there? No, no, let's destroy a nature preserve instead. I'm biking or running on this trail 3+ times a week and I think this is a great plan. It addresses current issues of access, safety and over-crowding during events (alive at 5, crew practice, etc). I love that the city is investing in this beautiful spot and encouraging more residents to visit and explore. "wow, if only there were a few thousand other people here, this place would be amazing"? So, we shouldn't encourage outdoor recreation but for a select few? We shouldn't increase awareness of our environment by encouraging outdoor recreation? Only those that are elite should be able to enjoy the preserve, right? I understand what you mean- I've spent a lot of time enjoying the preserve, both when peaceful and when busy. It's a lovely walk at 6am when the birds are chirping and nary a soul is in sight. I don't foresee these improvements as negatively impacting the area, though. Sure, it'll improve access! That's a good thing. It's a public park, and should be enjoyed by all who own it (aka, all of us). Let's not discriminate and assume the worst of people. I agree about with your point about improving other parks as well, but to me, as I no longer work down town, I see this as an opportunity to bring me back to the place I've spent a lot of time enjoying. This park is okay. Linear parks are so hot right now, and the view and breeze in the summer is great. That being said, the geese have got to go, they reduce the usable grass area by a large amount. I wouldn't worry about too many people here, downtown Albany has a keen sense of how to drive people away. Overall, the park seems to have an accessibility and purpose problem. It reminds me of Alec Baldwin from 30 Rock, who said to Tina Fey, "The dating world is like your hair: sometimes awkward triangles occur." The Corning Preserve is also an awkward triangle. Yeah, I actually do say "if only there were a few thousand other people here, this place would be amazing." Well, maybe that's an order of magnitude off, but it would be that many more people who are then downtown to spend money at businesses there. It's that many more eyes in a public space that can feel very unsafe in spots. And I don't believe in keeping nice things a secret just so I can keep enjoying them. The Corning preserve is within walking distance of plenty of Albany residents. Don't forget about those of us who live downtown and in the Pastures. Also the rezoning plan looks like it's trying to bring residents to the warehouse district which can be easily connected to the preserve. Yep, we need to capitalize on Washington Park too, but I'm glad to see some real effort being made toward something that can help revitalize downtown and make the waterfront more attractive. Thanks for the article AOA and thanks to Kate for taking the time to talk with you about it. Blech, this is hardly a nature preserve. As the new name makes clear, and all previous functions indicate, this is a park. As much as I'll miss a fully-formed *park* along the riverfront this summer, this is great news! I can't wait to see it when it's completed. I've been living in and around Albany for 20 years. 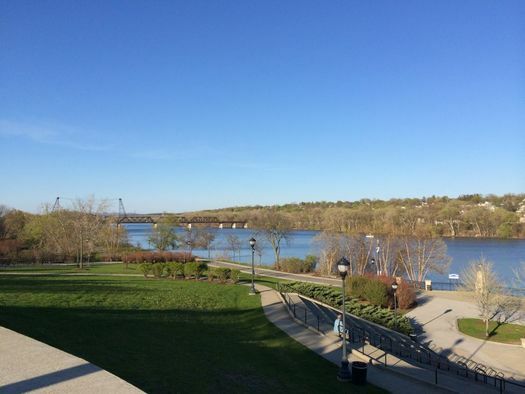 I only found out how to--consistently--drive to Corning Riverfront Park last year. (I've known how to walk there.) And I only figured out how to get on the pedestrian portion of the Dunn Memorial two weeks ago. 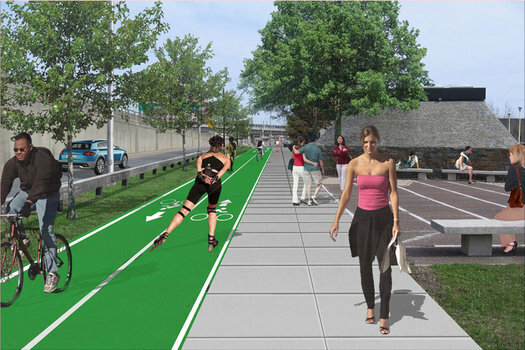 Also, the young lady in that pink shirt in the first rendering (3rd pick down) appears very unhappy. She's probably regretting only bringing heels. They're bringing back roller blades, white sneakers and tube tops too! 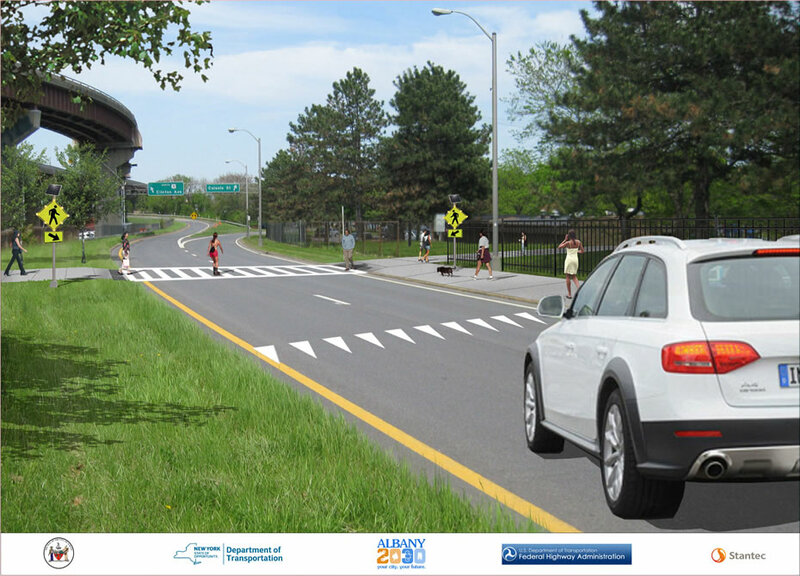 And I wonder - why they put cars with european license plates in these renderings? .....while we do not know the name of the particular artist behind this rendering, this unsung individual is clearly of the well known River's Casino/Schenectady School (if not the Master themself)! What took so long? Definitely safer and makes much sense, especially for traffic flow...it can only bring in more people into the city and the Warehouse District...start planning for new housing, amenities...reminds me of Boston Harbor/Wharf area on the waterfront...so many new housing options/retail/grocery/pharmacy/eating-drinking establishments/entertainment venues, but the interest in new visitors will be an engine starter...Brooklyn, etc. all made improvements for safer/brighter/newer quality of life issues...ya can't say enough when you have waterfront! Look at the Mohawk Harbor/Rivers Casino development! A win-win for 21st Century needs...good luck and keep up the good work...oh, and the downtown Arts scene, street/gallery's, etc. is fabulous and another major draw/plus/win win! Peace along the Hudson! 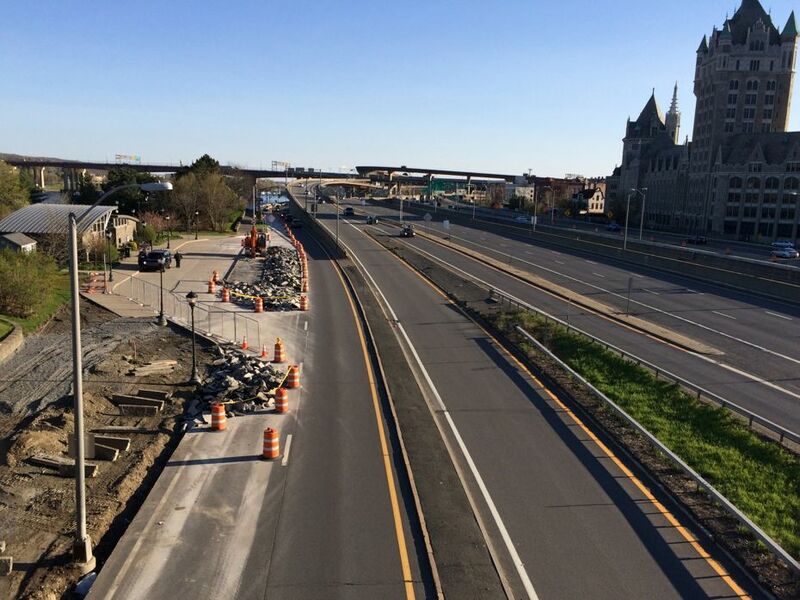 It is also clear that, instead of continuing to sink wasted money into maintaining I-787, we simply need to knock it down and convert it to a boulevard. Let's make this a truly livable City. We'll also need some type of continuous shuttle between the new Convention Center and the River/Park, etc. @Wayne.. the need and ability to move people around downtown beyond walking has escaped the current administration. . Downtown with the hills is not easy to navigate on foot .. I still remember a walk up the State St. hill in Dr Scholl sandals in 90 degree heat and 100% humidity 45 years ago that almost killed me when I was 19 fit as a fiddle.. And I did it in heels for 35 years for work and have the bad back to show for it. In the 1980s there were lunch time buses and sometimes trolleys (so cool) that made a continuous loop between N. Pearl and Lark and ESP every 20 minutes or so. From 11 - 2. Something like that is required. Getting people to all these new places and venues is something no one ever talks about. And prying people out of the convention center to actually see the city and spend money without organized tours etc is something no one ever discusses. And while I'm on a roll, this City failed miserably to support the Aquaducks.. shame on us.. That was the one people mover, Albany needs the equivalent of the Conch train in Key West.. and then throw in some nifty oh so cute trolleys that make a continuous loop at regular intervals throughout the day and stop downtown and cherry hill and the Ten broeck and the Warehouse district and Lark st. etc. is what we need. Our historic sites and new development area are out of the way and we continue to pretend that everyone who lives in and visits the city is a mountain goat . The Mayor's position appears to be walking is good for you.. just do it. Tell that to heritage tourism geezers who spend the money. We do not have a nice flat mall like DC or a High Line like NYC. Ok, some good points, and I'm going to backtrack and clarify some of what I said. My complaints are not really with the pedestrian and bicycle accommodations. I think those are great. What I'm less excited about is the idea that more people need to be drawn to this park with attractions and parking spaces. I'm not saying I don't want more people there (yes, there is something nice about the quiet space, but I'm not going to be selfish about it), just that I don't think we *need* more people there. Thanks for keeping it civil, Blech, you took a lot of heat there. It's pretty obvious that a lot of us residents (and especially those who are active on AOA) have pretty strong opinions, especially when it comes to change. The general consensus seems to be that so much change is necessary and it happens so slowly, there's a great deal of frustration felt when what looks like a good plan is naysayed. Hope that's understandable. No, we don't "need" more people in the Corning Preserve anymore than we "need" more people in any public space. What we want is a vibrant, thriving city that's desirable to reside in, which means attractive neighborhoods, in which public spaces play a huge role. This plan has the potential to improve quality of life in several neglected neighborhoods, particularly downtown proper, the pastures, the mansion district, and the warehouse district which the city seems to want to make a livable neighborhood. The preserve is walkable from all of these, especially if the approach near the Slater is improved. I understand the aversion to a focus on cars, and I'm usually one of the fist people to scoff at parking woes, but that's part of the beauty of this plan -- it can improve life for nearby residents and accommodate visitors from further afield. Anyway, thanks for being part of the discussion. Kayak rentals ,an easy, way to get to close-by parking by car and safety patrols- yeah , it's needed. Learn to sketch like your predecessors did. Sketch your renderings. Do not use a computer and overlay stock pictures of people doing things you need them to do but not in the true context of the project area.